Christmas comes with lots of expectations, hopes and desires. Some people LOVE the season with all its trimmings and parties and fun. And others wish they could skip December and go straight into January or even June. I normally wouldn’t even bring up this touchy topic this early in the year, but I want to let you in on some wonderful opportunities to PREPARE your hearts for a different kind of Christmas. (Oh, if you’re like me you will still celebrate your traditions and be madly checking off lists and baking cookies galore, but what if we could do this with a greater sense of God’s presence.) What if we practiced Christmas like Brother Lawrence lived out his life. Sometimes making a resolve before something occurs makes a huge difference in our lives. I often hear others or myself saying something like, “God loves me, in spite of my past or mistakes or failures.” or ” God loves me, even though I don’t deserve His love.” I’m here to say something new. GOD LOVES US! He loved us before we were born. We came into this world loved by God. Not because we were going to be someone or do something, not because He knew we’d mess up and He’d have to make us better. He just plain loved us and loves us! And He created us to love Him. So my resolve for this year’s Christmas season is to love! Plain and simple, however that might look in my particular family and community. I love how God weaves themes together. And allows us to meet kindred spirits along the journey. 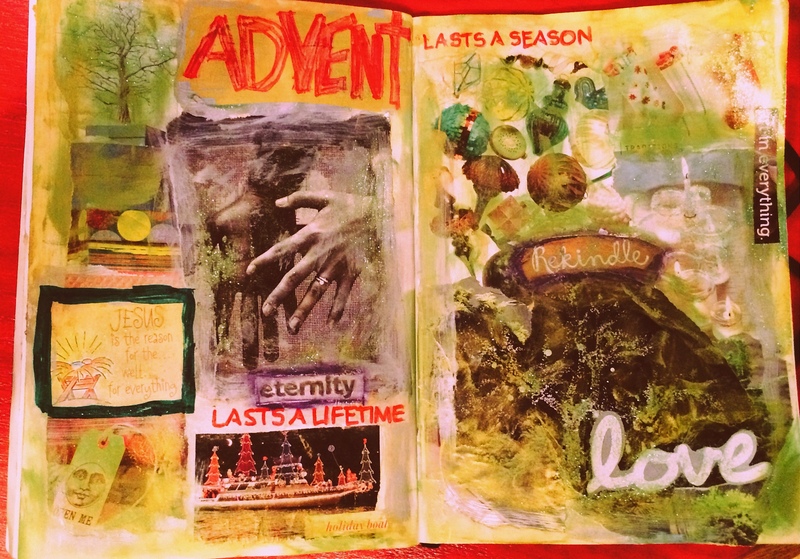 Victoria from Expectantly Listening is sharing her intentions for Advent, and she made a visual prayer focus to keep her heart tuned towards her desires for this season. Bernice and Diane are launching Pause, Ponder & Prepare this week. Make sure you scroll down their page and watch the videos to see the ART component they plan to facilitate. Here is my visual prayer collage for the ADVENTure ahead. These will be my guiding throughts as I approach my preparations, my times to pause and ponder, and my practice of Advent this year. How will you PREPARE for Christmas this year? Beautiful, Kel, both in word and image. And what better word, simply than LOVE to describe why Jesus came?! Love. I love that! And I? I’m already listening to my Christmas CDs. I traditionally begin this in October to prepare my heart. I’ve been doing this for years, long before the department stores exploited Christmas. This is not about sales for me or “rushing the season,” but about slowing down long enough and having ample time in which to prepare my heart. And, believe me, my heart needs lots of preparation. Lynni- I love how you prepare by listening to the music of the season. I like all sorts of Christmas music, both the sacred and the sentimental…I cry over “I’m Dreaming of a White Christmas” every year…I love recalling the story of God with us…and each year God seems to take me on a new adventure…I am sure I’ll be writing about it here, later this year! I listen mostly to traditional British carols, but must say, that I have a sentimental streak as well–especially White Christmas and Kenny G’s mellow sax. =] Oh, and Have Yourself a Merry LIttle Christmas……and no doubt, I’ve shared with you my Hugh Martin story. He wrote the song. Thanks for sharing Kel. Exactly what I needed to hear. Kel, when I get a sec, I will try to do that. Some truly are British, and others are just sung exceptionally well by British boys choir–the only way to go in my book of expertise–ha! Im such an amateur……but I just think they really know what they’re doing across the Pond! =] I thnk I’m really British in another life (actually, do have some ancestry from there).